Substance Credit to PATRICIA MAZZEI, AGUSTIN ARMENDARIZ, and ERIKA P. RODRIGUEZ. FEB. 6, 2018, New York Times, with editorial summary and comments by Riley Allen. 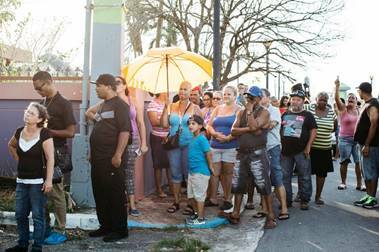 The mission for the Federal Emergency Management Agency was clear: Hurricane Maria had torn through Puerto Rico, and hungry people needed food. Thirty million meals needed to be delivered as soon as possible. For this huge task, FEMA tapped Tiffany Brown, an Atlanta entrepreneur with no experience in large-scale disaster relief and at least five canceled government contracts in her past. FEMA awarded her $156 million for the job, and Ms. Brown, who is the sole owner and employee of her company, Tribute Contracting LLC, set out to find some help. Ms. Brown, who is OBVIOUSLY adept at navigating the federal contracting system, hired a wedding caterer in Atlanta with a staff of 11 to freeze-dry wild mushrooms and rice, chicken and rice, and vegetable soup. By the time 18.5 million meals were due, Tribute had delivered only 50,000. And FEMA inspectors discovered a problem: The food had been packaged separately from the pouches used to heat them. FEMA’s solicitation required “self-heating meals.” TIFFANY BROWN DID NOT READ THE CONTRACT OR THE RULES AND NO ONE FROM FEMA MADE SURE SHE DID. Examples like the Tribute contract are causing lawmakers to raise questions about FEMA’s handling of the disaster and whether the agency was adequately prepared to respond. After Hurricane Katrina in 2005, a bipartisan congressional investigation found that a failure to secure advance contracts led to chaos and potential for waste and fraud. FEMA was similarly inept preparing for this storm. It was unprepared in anticipating hurricane damages and how to deal with them. In November, The Associated Press found that after Hurricane Maria, FEMA awarded more than $30 million in contracts for emergency tarps and plastic sheeting to a company that never delivered the needed supplies. THAT IS INEXCUSABLE. Who is watching FEMA to allow this type of incompetence to flourish? FEMA insists no Puerto Ricans missed a meal, but how does that make common sense in light of the facts? Of course, meals were missed and still are being missed. The storm shut down ports on an island that imports about 85 percent of its food supply. Farms were flattened. Supermarkets lost electricity and could not find diesel to run their generators. The stores that opened using generator power could not offer much from their understocked shelves. Ms. Brown described herself in an interview as a government contractor — “almost like a broker,” she said — who does not keep employees or specialize in any field but is able to procure subcontracted work as needed, and get a cut of the money along the way. She claims a fashion line and has several self-published books, and describes herself on Twitter as “A Diva, Mogul, Author, Idealist with scars to prove it.” Is that for real? That's how you get a $156M contract? After Tribute’s failure to provide the meals became clear, FEMA formally terminated the contract for cause, citing Tribute’s late delivery of approved meals. Ms. Brown is disputing the termination. On Dec. 22, she filed an appeal, arguing that the real reason FEMA canceled her contract was because the meals were packed separately from the heating pouches, not because of their late delivery. Ms. Brown claims the agency did not specify that the meals and heaters had to be together. These excuses on all sides do not cut it. Four cancellations involved the Federal Prison System, which found that Tribute failed to deliver meat, bakery, cereal and other food products to various correctional institutions. A fifth termination involved the Government Publishing Office, which terminated a contract for 3,000 tote bags after Tribute failed to print the Marine Corps logo on both sides of the bags. An investigation by the Office of Inspector General found that Tribute “altered and submitted a false shipping document and subcontracted the predominant production function on two contracts without proper authorization,” according to a 2015 report submitted to Congress. As a result of the botched tote-bag job, the Government Publishing Office prohibited the award of any contracts over $35,000 to Tribute until January 2019. But that exclusion applied only to that office, not to any other federal agency. HOW DO YOU POSSIBLY GIVE HER ANOTHER CONTRACT?